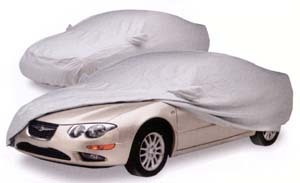 The Noah covers are all-weather protection using film barrier technology. This cover is made to fit the exact make and model of your vehicle. Both outer layers are bi-component spunbond, using sheath core technology. Each individual fiber has a polypropylene inner core for strength, with a polyethylene wrap for softness. The light grey color doesn't attract heat and the fabric is treated with UV inhibitors for extended outdoor use. The barrier layer is breathable film, a proprietary stretch-film technology developed exclusively for Kimberly-Clark. The film is stretched, and then subjected to a chemical process that creates microscopic holes smaller than droplets of water or dust, yet large enough to allow moisture vapor and heat to escape. This helps reduce the bulk of the non-woven fabric, while providing an almost solid barrier against the elements. Another bi-component spunbond, this one made with polyethylene and nylon, is used for the inner layer. The combination results in an exceptionally high strength-to-weight ration, with the "soft touch" necessary for today's water based paint finishes.